One-storey housing units are usually associated with rowhouse units that are in clusters and bare type. However, we have available furnished one-story house with attic. Rowhouse units are medium-density housing that are identical in a row or cluster. The houses share side walls. The first and last or end units of these houses usually have bigger lot areas than those in the middle or inner units. The house is livable meaning you can move-in once you have a take-out notice. You just do some minor fixing like putting linoleum on your flooring or slowly improve your house to look elegant when you have enough money for improvement or expansion. One of the advantage of bare types is that you can design your house interior based on how you would like to look and choose the best materials for your ceiling, partitions, etc. to make your house look elegant. If you opt for future expansion, choose one that has bigger lot area like end or corner units. End units have more space for expansion compared to inner units wherein you can expand in front or back only and may add another floor. 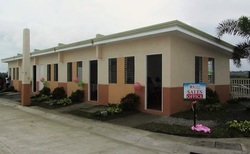 House expansion for sari-sari store, shop, additional rooms or floors must be with the approval of the developer. For house details, please click on the picture below.